Regardless of your age, gender, or activity level, there’s a good chance you will experience back pain at some point in your life. Back pain can appear suddenly or progressively get worse over time. Many actions and conditions can contribute to back pain, like excessive lifting or scoliosis, but it can also develop from the movements of daily life – like bending, rising, reaching, and twisting. Most aches and pains are due to muscular issues, such as strains or sprains, but in other cases, something more serious – such as a compressed nerve or damaged disk – can be to blame. It’s important to have a medical specialist determine the cause of your pain to get the proper diagnosis and treatment plan. 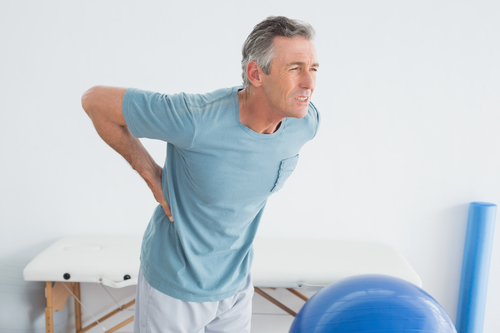 Many times, back pain does not require surgery and can be treated with physical therapy to reduce or eliminate pain. Physical therapy can also successfully help prevent future back issues. Diagnosing the cause of back pain can be complicated. The spine is an elaborate structure of bones, ligaments, tendons, disks, and nerves – all of which function together to help us move. These interconnected structures are not only subjected to the activities of everyday life, but also to powerful impact like twisting, jumping, and running. In addition, the intensity of pain is different for every person, and what might cause intense pain in one person may be manageable for someone else. Muscular Problems – Strain, irritation, or tension can be caused by poor posture or overexertion. Degenerative Disk Disease – The disks between your vertebrae act as shock absorbers. With age, it is common for those disks to degenerate, causing the collapse of the disk spaces. This can result in pain associated with cartilage break down, bone spurs, and pressure on the surrounding soft tissue and nerves. Disk Injury – Most common in the lower back, disk injury occurs when the inner material of the disk bulges or leaks out, putting pressure on surrounding nerves and causing pain in the back, buttocks, or legs. The onset of pain can be sudden – due to heavy lifting or twisting – or gradual, as a part of everyday wear and tear on the spine. Spondylolisthesis – This condition occurs when one vertebra slips forward over the one below it, resulting in leg and foot pain. Lumbar Stenosis – Nerve endings can be pinched due to the narrowing of the spinal canal or nerve root canals, resulting in leg pain, tingling, and numbness. Joint Dysfunction – When the joints in the back become irritated and inflamed, some people experience excruciating leg or lower-back pain. Vertebral Fractures – A break in one of the vertebrae can occur due to excessive force – such as an accident or direct blow – or (particularly in the case of the elderly) due to osteoporosis. Skeletal Irregularities – An abnormal curvature of the spine, such as scoliosis or kyphosis (hunchback), can cause discomfort and eventually become disabling. Sciatica – If the sciatic nerve – which runs from the lower back down each leg to the foot – becomes pinched or irritated, it can result in pain or a tingling sensation down the back of each leg. Physical therapy is not just for recovery from injury or surgery. It is often used to treat troublesome aches and pains in the back and other areas of the body. The goal of physical therapy is to lessen pain, increase movement and function, and teach patients how to avoid damaging actions in the future. A physical therapist may combine different treatments to address your specific pain. The therapies will typically include passive physical therapy and active physical therapy. TENS Unit – A Transcutaneous Electrical Nerve Stimulator (TENS) unit is a small battery-operated device that uses electrical stimulation to cancel the painful signals that are sent to your brain. Electrodes attached to the TENS unit are attached to your skin and deliver electric current from the TENS unit to your skin. A test session of electrotherapy with the TENS unit is usually performed first, and if you experience pain relief, you may be instructed to use a TENS unit at home for lower-back pain relief on a long-term basis. Iontophoresis – Iontophoresis is a type of electrical stimulation used to deliver medication through the skin. The medication is applied to your skin, and then an electrical current is used to push the medication into your skin and to the injury site. Often employed in cases of acute pain, iontophoresis can also reduce inflammation and swelling. There is usually a slight tingling sensation, but it should not cause pain. If the procedure becomes uncomfortable, your physical therapist can adjust the settings. Ultrasound – Therapeutic ultrasound uses sound waves to treat common back injuries like muscle strains. Sound waves are applied to the skin via an ultrasound wand, and the sound waves penetrate the soft tissues. Ultrasound is particularly useful for relieving acute episodes of pain and may improve tissue healing by reducing inflammation, increasing blood flow, and breaking down scar tissue. Heat and Cold Therapy – Applying heat and cold to treat back pain is very common, particularly if the pain is a result of a strain or over-exertion. Because it is readily available, convenient, and inexpensive, it is often used alone or in conjunction with other physical therapy modalities. It can reduce inflammation, pain, stiffness, and muscle spasms. It also promotes blood flow, which promotes healing. Stretching Exercises – Stretching the soft tissues (specifically stretching of the back, legs, and buttocks) can effectively alleviate a lot of pain. Stretching helps gain and maintain range of motion, and it assists in relaxing muscles that are tense or spasming. Depending on the source and severity of your back pain, a customized stretching regimen will be created for you. It will typically consist of exercises aimed at stretching the lower back, abdominal, hip, and leg muscles. Strengthening Exercises – Core muscle, lumbar stabilization, and other strengthening exercises are an effective way to reduce and prevent back pain. By strengthening the band of muscles that surround the spine, you can relieve the pressure and stress placed upon your back. While your strength exercise routine will be designed specifically for you, these workouts commonly include exercises that build up the abdomen, lower back, hips, and legs. Low-impact Aerobic Conditioning – Particularly important for long-term pain reduction and the prevention of future episodes of back pain, effective aerobic exercises include walking, biking, swimming, and water therapy. Aquatic conditioning can be particularly helpful to those who are new to exercise or who have mobility issues, as it minimizes the effects of gravity and requires less strength than land-based exercises. Almost every person will experience some form of back pain in their lifetime. In many cases, the pain will resolve itself with time, home remedies, and over-the-counter medication. If the pain does not taper off after a few weeks, though, or if you are experiencing numbness, tingling, or weakness, you should consult a doctor. While rare, back pain can be a symptom of a more serious underlying disease or non-orthopaedic condition, so symptoms should not be ignored. Countryside Orthopaedics can help you determine the source of your pain and outline a treatment plan to help you maintain a healthy back. Let’s get you on the road to pain-free living today!